When Liverpool fans cast their minds back to the summer of 1999, it undoubtedly conjures images of a frenetic period of transfer activity. After an abortive 1998-9 season, when the joint-managerial experiment between Roy Evans and Gerard Houllier was jettisoned in November, the Frenchman embarked on a significant rebuilding project. Tasked with bringing Liverpool into the 21st century, both figuratively and literally, Houllier swung the axe; David James and Paul Ince headed the list of Anfield exiles, following Steve McManaman who had run down his contract and flown to Madrid. 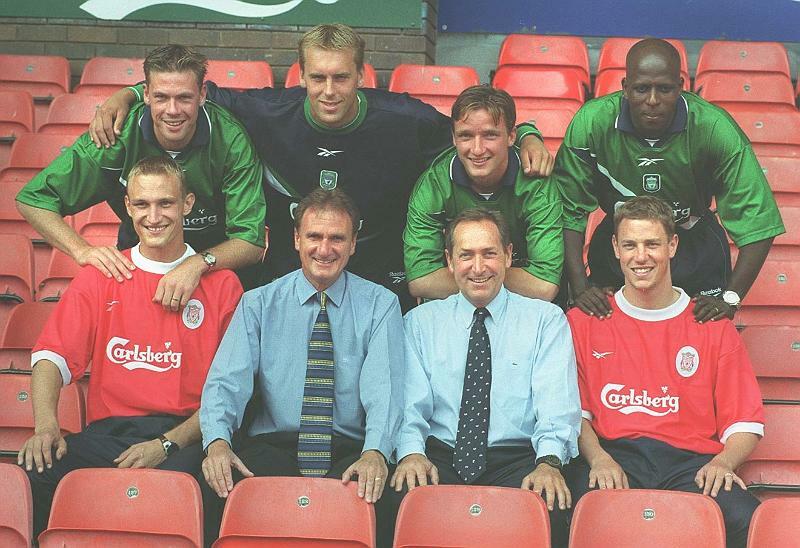 Houllier’s continental influx began with the £2.6m capture of club legend Sami Hyypia, supplemented by the arrivals of Didi Hamann, Stephane Henchoz, Vladimir Smicer, Titi Camara and Sander Westerveld. All six enjoyed a successful time on Merseyside; Henchoz and Westerveld were mainstays of the cup-treble-winning season, whilst Camara remains a cult hero on the Kop for scoring in front of them merely hours after learning of the passing of his father. The remaining trio went on to outstrip the rest with their enormous contributions in Istanbul in 2005, but there is another. A Dutchman whose time with the club was in no way as prosperous as the aforementioned, but whose personality imprinted him in the hearts and minds of those on the Kop to this day. His name is Erik Meijer. The statistics don’t make for pretty reading for the former forward; 27 appearances and two goals in his one full season. But to judge the career of the self-anointed ‘Big Dutchman’ on his rather modest goal scoring record (115 goals in 459 games) would be a tragedy for it does his story little justice. His position at number 99 in the fan-based poll of ‘100 Players who Shook the Kop’ reflects this, and like so many that have come before and after him, the ‘Big Dutchman’ is etched into Anfield folklore through song – “He’s big, he’s red, he’s off his f*****g head”. The appropriately christened ‘Mad Erik’ set the tone for his Anfield career early on. At a press conference to mark his move to the club, Meijer was asked what nickname he’d earned back in his native Holland. “They used to call me the Butcher,” said Meijer. Meijer arrived on Merseyside shortly before turning 30; both his age and the fact he was a free transfer point to the stop-gap role he was intended to fulfill at Anfield, but has caused discourse to since regard him as either a dud or a flop. ‘Mad Erik’ had made his name in the Eredivisie earlier in the decade; 34 goals in 66 games for MVV Maastricht landed him an international call-up and a move to Dutch giants PSV Eindhoven in 1993. The Dutch equivalent of Michael Rickets, one-cap wonder ‘Mad Erik’ mad his international bow and denouement against, of all nations, San Marino. The ‘Big Dutchman’ could not match his prolific goalscoring with PSV, where he played fourth fiddle in a front-line that contained Ronaldo, Luc Nilis and Wim Kieft. Before his move to these shores, Meijer spent three seasons in Germany with Bayer Leverkusen, where he formed an imposing partnership with Ulf Kirsten. Though his time on Merseyside appears, statistically, to be the least profitable of this career, it is where his legend soared. Featuring alongside Michael Owen and Robbie Fowler enabled ‘Mad Erik’ to further broaden his enviable list of strike-partners, but again he was unable to perform more than a withering imitation of more illustrious team-mates. His two strikes for the first-team came in the same game; a routine second round Worthington Cup victory at Hull City’s old Boothferry Park in September 1999. His following on-field contributions may be conspicuous by their absence, but ‘Mad Erik’ led the line for Liverpool in a famous 1-0 victory at Highbury, and a resolute 1-1 draw at Old Trafford in the space of three weeks. Legend speaks of the many Reserve games that the ‘Big Dutchman’ graced his presence with, as he hared around the pitch chasing lost cause after lost cause. His is the case of a man who made up for his limited attributes with commendable application. His talent was questionable, but never his work-rate, attitude or commitment, which endeared him so much to the Kop. 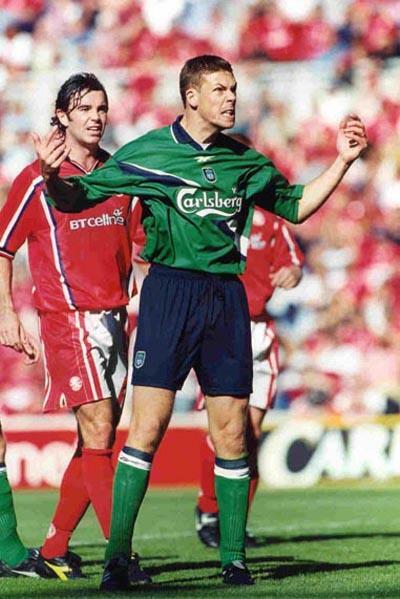 It is appropriate, then, that ‘Mad Erik’s finest moment in a red shirt came off-the-pitch, when he turned up in Dortmund for the club’s 2001 Uefa Cup final with Alaves wearing his Liverpool ‘Meijer 18’ kit. Meijer drifted into obscurity in the years after he departed Anfield; a fruitless loan spell at Preston North End, before returning to the Bundesliga with Hamburg. He finished his career at Alemannia Aachen, who he helped into the DFB-Pokal final in 2004 where they were defeated by Werder Bremen. But, as Bremen were German champions, Aachen were granted a passport into the Uefa Cup. Meijer’s final season in professional football saw him skipper the minnows, leading them to promotion back to the Bundesliga after a 36-year wait. The ‘Big Dutchman’ has taught his art as Director of Sport with the German club, and is a patron of AFC Liverpool, again demonstrating the mutual admiration between him and the Liverpool supporters. He is now currently working for Sky Germany on their Champions League coverage, with his own section entitled ‘100% Meijer’, presumably an upgrade on Andy Townsend’s ‘Tactics Truck’. Some say he is an expert, and they would be right. We live in an age dominated by introverted, monosyllabic footballers, those who let their eccentricity run amok are few and far between. In that respect, ‘Mad Erik’ deserves appreciation, and it is for that work ethic that we should judge him. This entry was posted in Obscure footballer of the week and tagged alaves, alemannia aachen, anfield, bayer leverkusen, big dutchman, didi hamann, erik meijer, gerard houllier, hamburg, holland, liverpool, luc nilis, mad erik, michael owen, psv, robbie fowler, ronaldo, sami hyypia, sander westerveld, stephane henchoz, titi camara, uefa cup final 2001, vladimir smicer, wim kieft by James Dutton. Bookmark the permalink. met erik in maastricht in 2009 when I was over for the holland v scotland match with my brother whom had been based in laarbruck close to maastrich in the mid 80,s spent a great night in his company talking football and his love of liverpool was clearly evident right down to the dodgy imatation scouse accent areal gent .